My son, G, is in first grade. He’s learning to read and write at a rapid pace right now. It’s so much fun to watch. For now, he mainly writes phonetically, but I can see he’s learning to spell better each day. G has been writing lots of letters lately. He’ll write them at home and at school. His teacher has a nice little worksheet set up like a real letter. All the kids have to do is fill in the date, the greeting, write the message and sign their name. She even has envelopes to hold the letters they write. I love that G is encouraged to write letters since we sometimes forget what it’s like to actually hand write a note to other people. 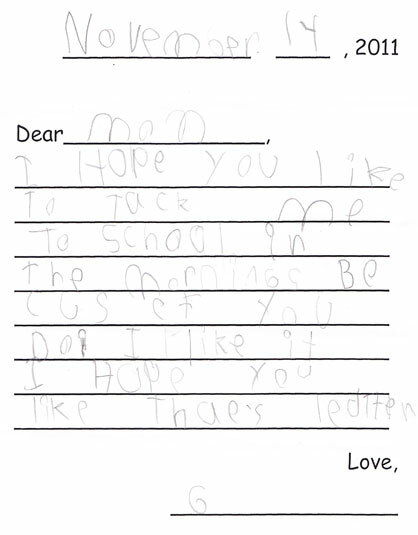 Just yesterday, I got the following letter from G.
I hope you like to take me to school in the mornings because if you do I like it. I hope you like this letter. Who doesn’t enjoy getting a handwritten letter from someone they care about? Think about it and be honest: When’s the last time you wrote a letter to someone? Just a nice note of thanks or thinking of you or just happy to know you. Try writing one today. After all, it is I Love to Write Day. Go ahead and do it. Write a letter. I promise you will put a smile on the recipient’s face.